Carlita Santaro has never felt like a “proper” princess, and she’s finally escaped the palace for the small town of Winter Haven. Daniel is an award-winning journalist, but now, as a single dad, he’s working on a gossip show – better hours but rock-bottom morals. His boss orders Daniel to test suspiciously down-to-earth Calita – is she really royal, or just posing as a princess? Carlita captivates Daniel, but soon he’ll have to choose: Should he follow the headlines, or his heart? I so enjoyed this Harlequin Romance. The tone is sweet with some serious moments that balance the sweet perfectly. I really liked both Carrie and Daniel. Their romance is fairly innocent as they are usually chaperoned by Daniel’s daughter, Annabelle. What I liked most about THE PRINCESS TEST was the heart in the story. Daniel is trying to learn to connect with a daughter he doesn’t know well even a year after his wife passed. Carrie is trying to figure out where she belongs and who she truly is. They help each other in ways that they could have never predicted. 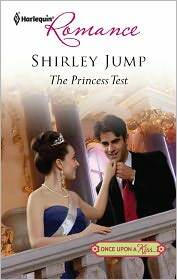 THE PRINCESS TEST is a sweet and emotional read that I recommend 100%. I have not read any of the series type book. But it does sound very interesting. And a 5/5 what could be better? This sounds like a wonderful read. You give the best reveiws here. Hmmmm. Yes. I think I will read this one!